At the official opening of Aston Martin's first ever dedicated design centre in Gaydon, Warwickshire, on Tuesday 11 December, Dr Ulrich Bez, Chief Executive Officer, thrilled an audience of more than seven hundred VIP guests with a surprise unveiling of a stunning new 600bhp performance concept car; the V12 Vantage RS. 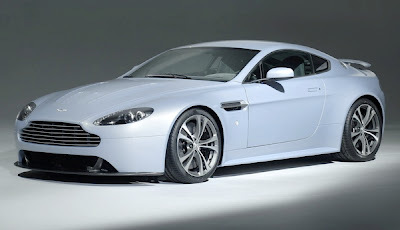 The V12 Vantage RS concept is based on Aston Martin's critically acclaimed V8 Vantage coupe, but the company's design and engineering team have fully exploited the design flexibility of their unique VH architecture and the motor sport development of their 6.0 litre V12 engine to create a dramatic and production feasible concept car focussed on extreme performance and dynamics. Although the 600bhp power output of the V12 Vantage RS concept will be the focus of attention, just as significant is the level of weight reduction achieved by Aston Martin's engineering team. With a kerb weight of less than 1600kg, the RS concept underlines Aston Martin's continued commitment to intelligent use of materials and weight reduction as a means of achieving improved efficiency and performance. In common with the recently launched DBS, the bonnet and trunk lid are moulded in carbon fibre and the concept also adopts motor sport-inspired carbon ceramic brake discs. Director of Design, Marek Reichman, commented: "Much of Aston Martin's recent success has come from the ability of our designers and engineers to work hand-in-hand to optimise form and function. Our new dedicated design centre will take this process to a new level and I am delighted that the V12 Vantage RS is the first car to stand on the turntable in the studio." The unveiling of the Aston Martin V12 Vantage RS concept concludes a remarkable year of new product announcements for the British manufacturer. In the last twelve months the company has launched two of the most eagerly anticipated sports cars of the year - the DBS and Vantage Roadster - and announced details of the DB9 LM and V8 Vantage N400 special editions which celebrate the company's racing successes at Le Mans and the N?rburgring. All of these models now join the award-winning V8 Vantage, DB9 and DB9 Volante models in production at the company's Gaydon headquarters.